By Dan Ambrose: WBA “regular” welterweight champion Keith “One Time” Thurman (26-0, 22 KOs) still believes WBA/WBC 147lb champion Floyd “Money” Mayweather Jr. (48-0, 26 KOs) put unbeaten hard hitting #8 WBA contender Errol Spence Jr. (17-0, 14 KOs) on him to get him to back off from badgering him to try and get a fight. Despite Spence saying himself that he wants the Thurman fight because he sees him as a flawed fighter that he can beat, Thurman doesn’t believe that Spence is sincere about wanting to fight him. He thinks that the only reason why Spence is saying he wants to fight him is because his “Uncle Mayweather” put him up to it. While Thurman says that he’d be willing to fight Spence if he felt that he deserved the shot, he says he doesn’t want to fight him now. This has many boxing fans believing that Thurman is just plain afraid to fight Spence because he hits harder than anyone that Thurman has fought before and he’s deadly accurate. I don’t think Mayweather is asking a lot of Thurman. Mayweather has something that Thurman wants – his titles and a huge payday he’d get in fighting him. Mayweather is basically telling Thurman that if he wants to prove himself worthy of fighting him, then he’s got to prove it by fighting someone who he feels is a very good fighter in Errol Spence. Thurman seems to feel that Mayweather is obligated to fight him just because of the guys that he’s fought in the past and because he holds the WBA “regular” welterweight title. But the problem is Thurman has never fought anyone that you can call a good fighter. The best guys that Thurman has beaten are Robert Guerrero, Luis Collazo, Diego Chavez, Jesus Soto Karass, Julio Diaz, Carlos Quintana, and Leonard Bundu. Those are pretty much all fringe level and non-top 15 ranked fighters. Quintana is retired. Diaz looks to be finished as well. Soto-Karass is a 2nd tier fighter. The rest of the guys are bottom 15 fringe level fighters. You can’t blame Thurman for the weak match-making that’s been done on his behalf, but since he’s the product of the match-making, you can’t say he deserves a shot at Mayweather either. Thurman went along with the watch-making that’s been done for him, and for that reason he has to deal with being passed over by Mayweather because of the fact that he’s never fought anyone good before. If Thurman doesn’t want to fight the one good opponent that Mayweather has asked him to fight in Errol Spence, then it kind of shows you that Thurman feels that he doesn’t have to work for something. He just wants the Mayweather fight to be plopped into his lap without him having to do anything to earn it. Thurman can complain and be bitter about Mayweather passing him over for the fight, but Thurman really can only blame himself because he was told what he needed to do in fighting Spence and he chose not to do it. Thurman has taken the safe route by electing not to fight Spence, and now he’s upset with Mayweather for clueing him into a path that he needed to take. Spence (17-0, 14 KOs) certainly deserves a world title shot against Thurman more than Collazo, doesn’t he? Collazo wasn’t ranked in the top 15, and had recently been beaten by Amir Khan. So why did Thurman fight a non-ranked fighter like Collazo rather than a top 10 ranked contender like Spence? It didn’t make sense for Thurman to fight Collazo but not Spence. Besides that, Thurman isn’t really a ‘real champion’ in the minds of a lot of boxing fans, because the WBA has two world champions for the same weight class at 147. There’s Thurman, who is more of an interim strap holder, and then there’s Mayweather, who holds the WBA Super World welterweight title. Many boxing fans see Mayweather as the real WBA champion and Thurman as just the interim WBA strap holder. I believe that Thurman doesn’t want any part of fighting Spence and he’ll use whatever excuse he can think of in order not to have to face him. Spence is seen as the future of the welterweight division, and Thurman is just some guy that is holding down one of the WBA’s minor belts. Thurman is not THE WBA 147lb champion. That title is held by Mayweather. Thurman had a chance to pick up one of Mayweather’s two welterweight titles if he agreed to fight Spence, but he turned down the fight. Why would Thurman turn down a chance to pick up another welterweight title by fighting Spence? That’s a good question. I don’t see Thurman fighting any of those guys, and I definitely don’t see him fighting Spence. At best, I see Thurman continuing to fight Khan’s leftovers by facing someone like Chris Algieri. 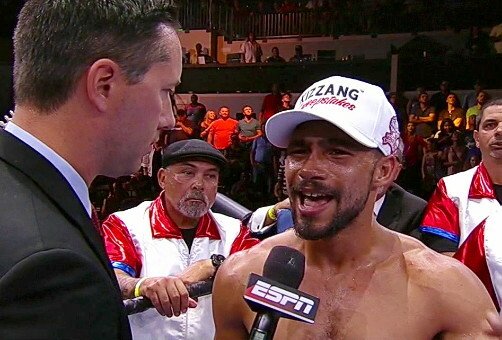 Thurman already fought two of Khan’s past opponents in Julio Diaz and Collazo. Now I think we’ll see Thurman fighting Algieri. I don’t know how the World Boxing Association will justify letting Thurman take the fight with Algieri coming off of a loss to Khan, but then again the WBA let Thurman defend his title against Collazo, who had been recently beaten by Khan.